Explosion Lawsuits Related to McNeilus Truck CNG (Compressed Natural Gas) Systems | Pritzker Hageman, P.A. Explosion and burn attorneys, Fred Pritzker and Eric Hageman have filed a lawsuit against Swagelok Company after a January 11, 2017 explosion at the McNeilus Truck and Manufacturing plant in Dodge Center, Minnesota seriously burned their client. The lawsuit alleges that the hose-fitting connection on the compressed natural gas (CNG) system in a truck being assembled by McNeilus was involved. Our explosion lawyers have successfully used their experience to investigate complex explosion cases. They have access to highly-qualified experts and have a track record of representing clients injured in explosions. Our efforts have resulted in multimillion-dollar settlements including a $10 Million Settlement for Man with Third-Degree Burns that occurred in a propane explosion. We work for our clients to hold wrongdoers responsible. We have taken on Fortune 500 companies, insurance providers, restaurants, and many others. We have won over 70 multimillion-dollar cases for our clients. Because of these past successes, we have the resources and skill to unearth evidence to win complex cases. Attorney Fred Pritzker is listed as a Best Lawyer for 2018. 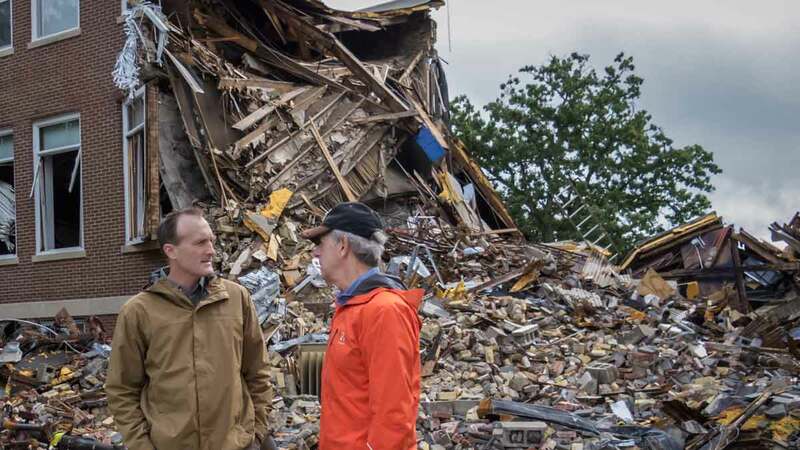 Attorneys Eric Hageman and Fred Pritzker at the scene of a fatal explosion. They are representing the family.